SSR LLC – GE(e) – Is That What The Chart Is Telling Us! GE(e) – Is That What The Chart Is Telling Us! 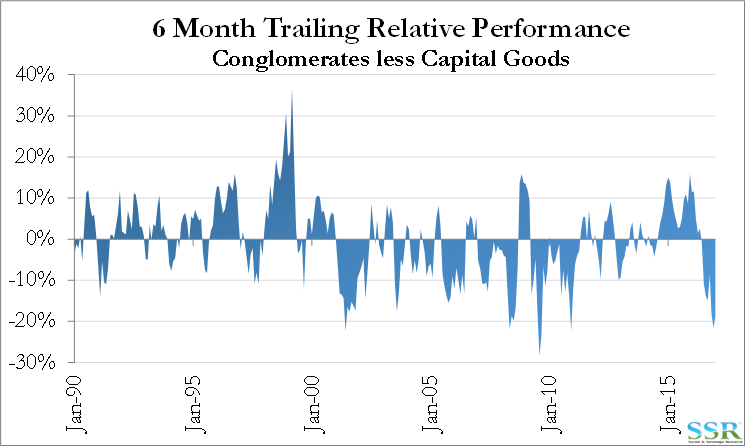 Exhibit 1 shows a very interesting relative performance history between our Capital Goods Index (comprised of the largest US names) and Conglomerates Index (similarly comprised but with fewer constituents). If the repetitive nature of the chart continues, we are at, or close to an extreme, from which Conglomerates should outperform Capital Goods by 20-35%. The second option is that the chart does not repeat – can we articulate a reason why 27 years of history should suddenly change – is there a Trump related reason? We struggle with this as likely Trump policies on manufacturing, tax, foreign earnings repatriation and infrastructure should benefit the conglomerates as much as the capital goods companies. We are focusing on “Option A” – the sequence repeating. 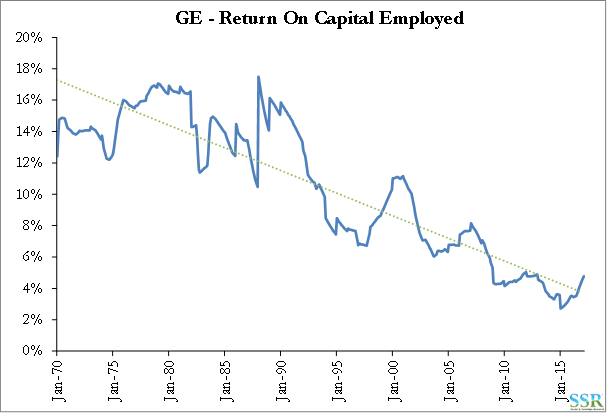 If the pattern repeats, then the question is what is the best stock to capture this opportunity. 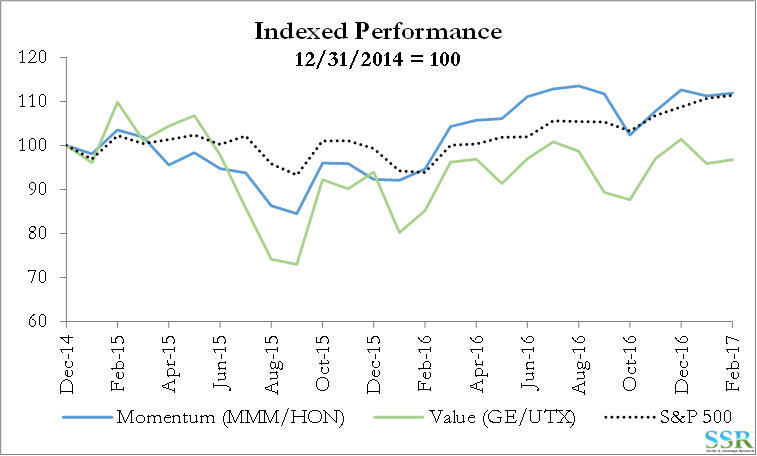 Despite some value and momentum names in the conglomerates space we believe GE is a worth investigating at this point. In GE we have a recovering return on capital story, a deal with Baker Hughes to fix the under-earning energy business and an unloved stock. If current returns on capital could be considered the new “normal” with no further improvement, GE should be a $38 stock in our view. Elsewhere in conglomerates we appreciate that the multi-year momentum at HON and MMM may still prove successful. On the short (caution) side in Capital Equipment we would look at PH, DOV, DCI, ITW, GGG, LECO and CAT based on a combination of value and business mix. This research note was borne out of Exhibit 1. Or – How could it be different this time – what would keep the divergence expanding? We struggle with a set of circumstances which would allow this to continue – barring a series of stock specific issues with the Conglomerates – along the lines of UTX’s engine problems. Taking the first approach we than have another dilemma around how to play the idea, especially for Conglomerates. 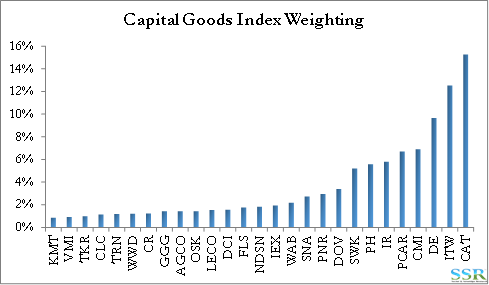 In Exhibit 2 we show the components of our Conglomerate and Capital Goods Indices and their weightings. – financial returns (Exhibit 4) – total shareholder returns (Exhibit 5). We can certainly see a case for sticking with what is working, particularly in a US investment/tax friendly/cash repatriation environment, and it is possible that both HON and MMM could outperform for another year. But we by nature and (probably more so) by nurture (Chemicals Analysts/Bernstein trained) like to find value! This pulls us towards GE – with more color in subsequent sections. Alternatively, you could hedge and buy all four names. SWK is one of our favorite long-term holdings and we see no reason to change that view because of what Exhibit 1 shows us. DE has continued to gain support – there are some stubborn floor prices for the stock and this makes taking an underweight position challenging in a volatile market as DE should outperform a falling market. Engines and Trucks – if the infrastructure and manufacturing momentum continues – this area could bounce back. CAT is one of the more obvious targets – not that expensive based on history but likely pricing in a larger share of any infrastructure benefit than it will get. CAT i.e. perhaps more interesting as an underweight if you believe that a prolonged mining down cycle and greater global competition, put its return to former “normal” trends at risk. 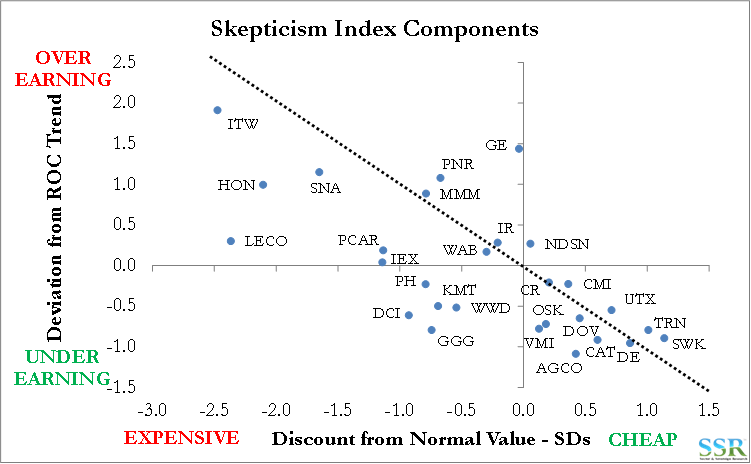 Values for the names in Exhibit 2 are summarized in Exhibit 6 and 7 and we show skepticism indexes in Exhibits 8 – note that a negative skepticism index means that the stock is discounting improving earnings – the bigger the negative the more earnings have to improve to justify the share price. 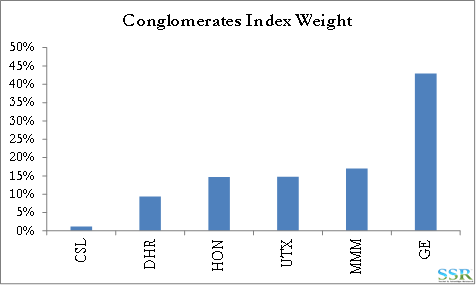 The analysis would support a GE overweight (much more so than UTX) and underweights in PH, DOV, DCI, ITW, GGG, LECO and HON. 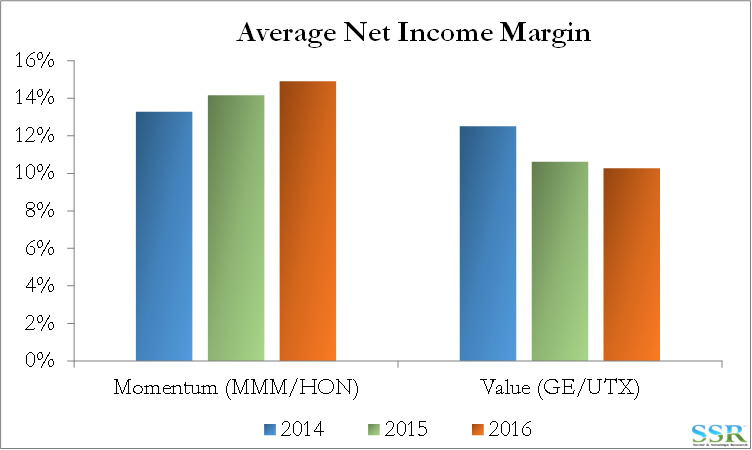 GE – Tempting: But Hard to Understand and The Financial Liabilities Remain a Risk. As soon as GE ran out of consistent earnings growth – which in the later years were in part manufactured by its expanding financial arm – it became viewed as a complicated mess, that few understood and even fewer were willing to do the work on to understand better. There were easier to understand stories to invest in. The addition and rapid expansion of the financial arm destroyed return on capital, even before the financial market collapsed – Exhibit 9 – and once the reliability of earnings was questioned the relative multiple collapsed – predicting the continued recline in financial returns – Exhibit 10. The relative PE collapsed when predictable earnings growth stopped (2000/2001) and then again when the financial assets became liabilities in 2008/9. 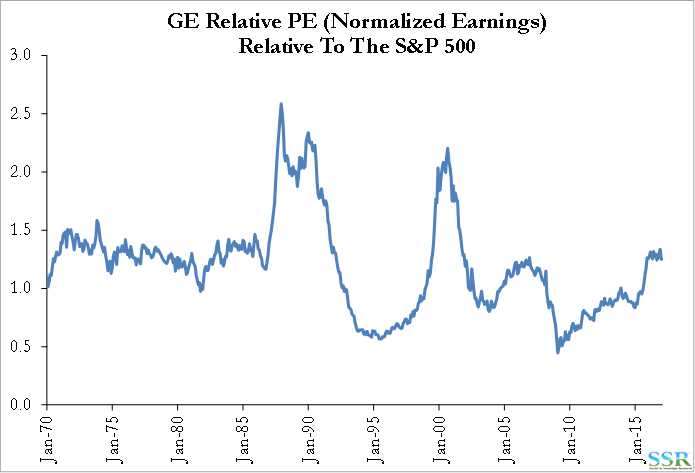 Since that time we have seen the relative multiple rise but that is in part because our “normal” earnings are following the return on capital trend in Exhibit 9 – so they are declining. 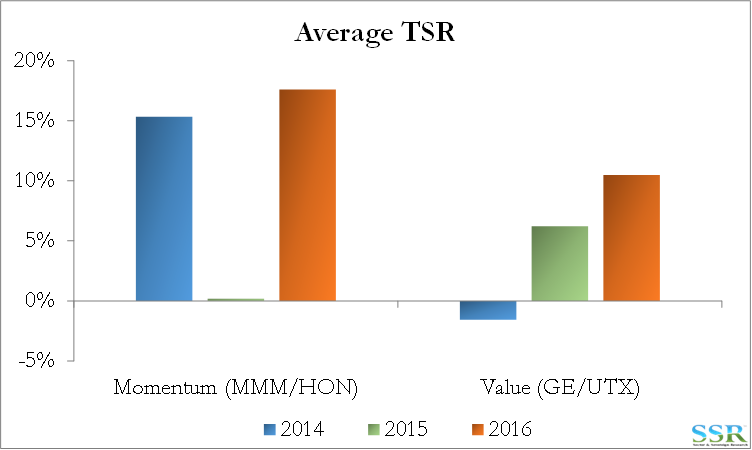 The value in GE only really exists if the return on capital trajectory is turning and that is unclear, given the large level of financial based assets on the books and their negative contribution to earnings. 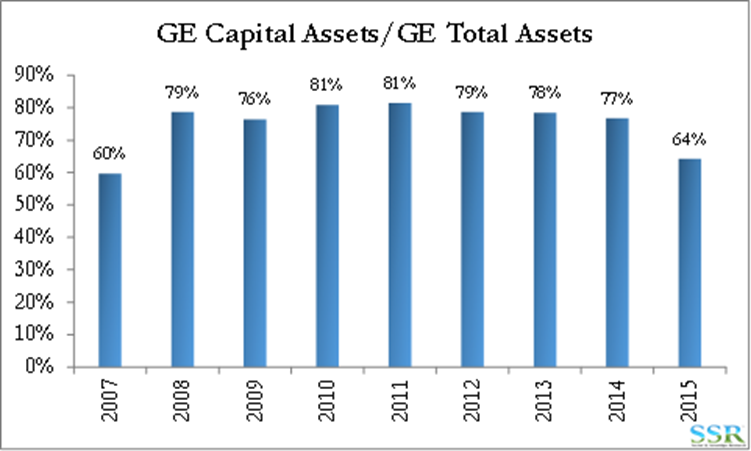 If we look at GE’s businesses the return on assets for each business is largely in line with competitors – Exhibit 11. The opportunity looks like it is Oil and Gas (and Healthcare to some extent) and perhaps the Baker Hughes deal is a way to improve returns – although SLB is best in class at that level of scale so it would be a stretch goal. The key to improving returns and reducing complexity is to continue to shed financial assets – despite divestments and industrial acquisitions so far GE has not made much of a dent – Exhibit 12. These assets have a negative return and complicate the overall picture. If current return on overall capital of 4.8% (Exhibit 9) were the norm (against our current trend derived level of 3.7%) normal value would increase from $28 per share to $38 per share – 28% upside from current levels. It should be noted that to reach our normal value would require a greater uplift from multiple (investor confidence) than it would earnings, as consensus estimates for 2017 are only 3-4% lower than our model would predict at a 4.8% return on capital. It should also be noted that the Baker Hughes deal will likely change the capital base and confuse things again for a while.